Liam Rafferty, Frank Burns and Richie Donnelly have been drafted into the Red Hands team for Saturday night's Ulster derby against Monaghan. Rafferty is named in defence and Donnelly comes into the forwards while Donnelly starts for the first time this season at midfield. 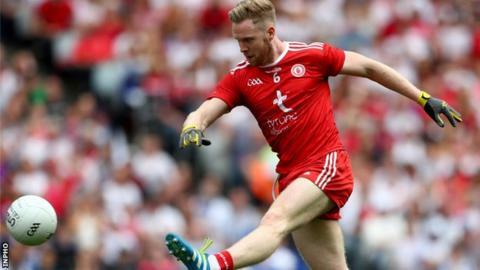 Mickey Harte's side have struggled in their Division One campaign with just one point picked up from three games. Monaghan are a point better off and also in relegation trouble. Tyrone have also made four positional switches for the Healy Park showdown. Padraig Hampsey takes over at centre half-back, Cathal McShane and Kieran McGeary move to the two corner forward slots while Peter Harte shifts to full forward. Michael Cassidy is on the bench and into the list of 26 for the first time this season comes Conor McAliskey, having recovered from his major ankle injury. Missing out on a place in the matchday squad are Conall McCann, Conan Grugan, Ronan O'Neill and Darren McCurry. Tyrone: N Morgan, L Rafferty, R McNamee, M McKernan, T McCann, P Hampsey, B McDonnell, B Kennedy, R Donnelly, M Donnelly (capt), N Sludden, F Burns, C McShane, P Harte, K McGeary. Ballymena United boss David Jeffrey calls for one final push from his side as they seek to secure second place in the Irish Premiership. Retiring forward Colin Shields and Belfast Giants teammate Paul Swindlehurst are named in the GB squad for the World Championships in Slovakia.